Centre For London’s recent report on the potential for more “meanwhile” projects in the capital’s unused building and land spaces begins by setting the phenomenon in its historical context. “Making use of stuck or forgotten spaces is part of London’s history,” it says. That history is rich and varied. Authors Nicolas Bosetti and Tom Colthorpe tell us that during during the 1970s, an estimated 30,000 people lived in squats – that was one sort of what we now call a meanwhile use. They also tell us that institutions now fixed in the London landscape were originally planned as temporary affairs in spaces that had slipped into limbo: the London Eye, for example, and the Young Vic, would you believe. They were another kind of “meanwhile”. This characterisation of meanwhile as a new name for a bunch of things that have been going on in different forms for a long time is a valuable reminder that spare land in London has long been sought after and property here has never been cheap. A distinctive part of today’s situation is that in a high growth, population booming city, those features have become more and more pronounced. Another is a wider recognition that meanwhile uses can be of value to a variety of different interest groups and that all can benefit from recognising this. I recently wrote about Platform, a former cork factory close to Southwark Underground station owned by Transport for London. It will eventually be profitably redeveloped, but for now has been let rent-free to artists and entrepreneurs who would otherwise struggle to find a home they can afford. TfL is rightly proud of this initiative, which is both philanthropic and commercially wise. The presence of a creative community there adds to the attractions of the area, which won’t do any harm to the value of the asset in the long term. And if you find that cynical, try thinking of it as a way to help future Mayors keep the cost of your bus fare down. The fact that the Young Vic, just up the road, uses one of Platform’s rooms as an extra warm-up and performance area makes a nice link with meanwhile’s past. Another meanwhile manifestation with antecedents is that of the property guardian. Katharine Hibbert, who runs the DotDotDot company, wrote about it here. When I first moved to London in 1979, equipped only with a portable typewriter and a lot of stubborn optimism, I lived firstly in a shabby bedsit in Portobello Road before moving into short life housing in Islington. The council had bought a bunch of terraced houses with a view to refurbishing them for tenants, but in the, ah, meanwhile, they were squatted. The squatters were well-organised, formed a co-op and negotiated an agreement with the council that they would be free to stay for the time being. This made sense for Islington, as it meant the houses would not be trashed or fall into decay. Property guardianship is a more institutionalised and business-like progression from short life and, when working well, provides low cost, short-term accommodation to people who would struggle to afford anything else. Meanwhile can also be retail. One of the more diverting examples is the Artworks at Elephant and Castle, built from repurposed shipping containers. As well as studios and offices for artists and other creative businesses, it has “pop-up” food and drink outlets and venue space for hire. Artworks Elephant is in part an attempt to humanise an area behind Elephant & Castle station and shopping centre that would otherwise be a mere adjunct to a building site (see photo, taken in 2016). I’ve heard a man from Lendlease observe that it will hurt to dismantle it when the time comes, because it’s so nice there and so popular. 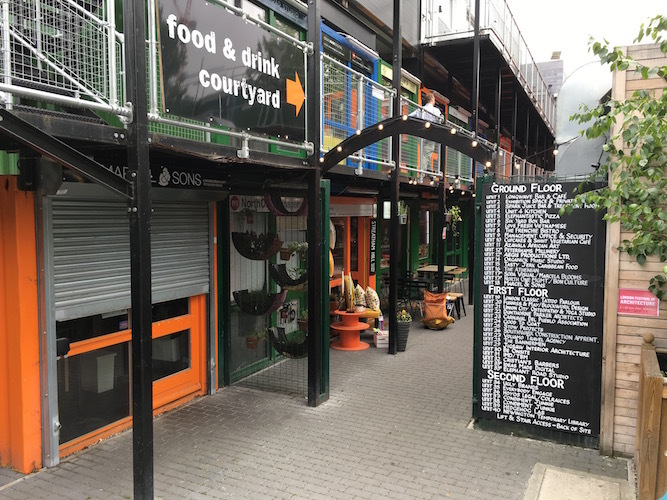 Bosetti and Colthorpe calculate in their that there are 24,400 commercial properties in London that could be used for temporary workspaces, shops or homes, most of which have been mothballed for at least six months. Their combined floorspace is put at 1.8 million square metres, fifteen times the floorspace of Westfield London in White City. They say that owners of these buildings and pieces of land often overestimate the risks and fail to see the value of making them available for meanwhile use, while planning rules and a shortage of organisations specialising in managing such projects are further obstacles to bringing them to life. If its cultural fringes are vital to the city’s soul, meanwhile is a way of keeping it strong. Read the report in full via here.